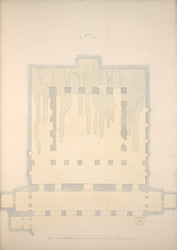 Pen-and-ink and wash drawing of the ground plan of Cave 14 at Ajanta, from an album of 26 ground plans of the Ajanta caves and 16 folios of drawings of sculpture and architectural details in the Ajanta caves, by Capt. R. Gill, dated c.1850. excavated between the second - first centuries BC; then, after a period of more than six centuries, the excavations restarted around the fifth century AD, under the Vakataka patronage. Cave 14 is a large monastery which left unfinished in the fifth century. It has a verandah with ornamented columns and a partially excavated hall.